Alexander Blok, a glamourous representative of the Silver Age in the Russian art. At the turn of the 20th century Silver Age produced a whole host of remarkable poets, among them Konstantin Balmont and Andrei Bely, Marina Tzvetaeva and Anna Akhmatova, Nikolai Gumilev and Maximilian Voloshin. Alexander Blok occupies a particular place in this constellation of poets. His contemporaries regarded him a prophetic poet with a rare feeling for any kind of upheavals and changes. At 17 as he filled in a family questionnaire and came to the question of where he would like to live Alexander Blok pronounced one word only: Shakhmatovo. Shakhmatovo was an estate near Moscow belonging to the poet’s grandfather, in his time a rector at the University of St. Petersburg. Alexander Blok first visited the estate when he was a baby and then came every summer throughout the whole of his 35-year life span. In the estate he rediscovered Russian nature and folk life, started to write poetry and met his fiancée, Lyubov Mendeleeva, whom he dedicated his first collection of poems “Verses about A Beautiful Lady”. In his verse an ordinary country lass is elevated to the unattainable and an encounter with her is portrayed as that of a knight with a lady out of this world. Professor Amina Gazizova, who has been doing research into the poet’s work, is reflecting on how the poet saw Shakhmatovo. In Shakhmatovo Blok saw the idea of his own garden, a model of perfectly harmonious life. For years he cultivated the garden toiling day and night as a person and as a poet. Blok dreamed of a life close to people, nature, land and creative work and he spared no effort planting trees, digging the soil, mending the fence and creating something new with his own hands. He was building a warm home for his family, for his mother first of all, and then for his fiancée and wife. 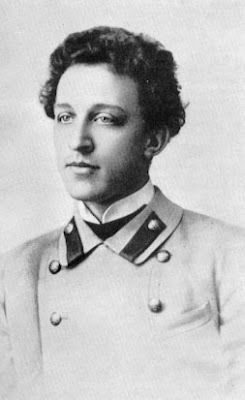 After moving to Petersburg in 1905 Alexander Blok takes an active part in its cultural and public life. In those days artistically-minded intellectuals gather for regular meetings at the place of a symbolist poet, Viacheslav Ivanov. Alexander Blok comes regularly too, and it was at Ivanov’s that he first presented one of his most popular poems “The Unknown Lady”. A contemporary recalls that the poet as he read his verse was dressed in a long frock coat with a soft tie carelessly draped round his neck. In the halo of ash-gold hair he looked romantically beautiful then, the contemporary recalls. Also during those gatherings originated the project of a new theatre, which gripped Alexander Blok completely. The poet wrote several plays defining the genre as lyrical drama. Those were “The Song of Fate”, “The Rose and the Cross”, “The Fair Show Booth”. Blok’s plays had little in common with the usual theatre repertoire, which largely explains why they seldom if ever saw successful stage productions. In the poet’s lifetime the only successful production of his plays was “The Fair Show Booth”, which was directed by the famous theatre reformer Vsevolod Meyerkhold. At the time of radical change in the Russian history – after 1917 – Russian intellectuals were faced with a difficult dilemma: to accept the Bolshevik regime or oppose it and defend the interests of tsarist Russia. Alexander Blok made his choice through the following motto: “With body, heart and mind – listen to Revolution!” He then writes his landmark works – the poems “The Twelve” and “The Scythians”, in which he voices a nearly sacred attitude to the Revolution and sees it as the only possible future for Russia. Blok saw the Revolution as imminent, - Amina Gazizova goes on to say, - so it wasn’t by chance that he wrote the feature “Katilina” and other texts in which he drew a close parallel between the age of Russian Revolution and the arrival of Christianity in the Roman Empire. Blok thereby spoke of the imminent coming of a new world, new ideas and a new religion. A poet and a spiritually inspired personality, Blok thirsted for transfiguration of the world on the basics of spirituality and religious strength. Despite the ordeal Russia had to go through Alexander Blok never lost faith in a better future for his country. He never forgot that there had been such periods in the Russian history before, when Russia seemed to be on the verge of death. And every time it stood the test of time. Today Blok’s poems sound as words of love and endless faith in Russia coming to us through the centuries. Blok was also an influence on a younger generation of Russian writers. Both Pasternak and Nabokov wrote of the influence Blok had on them, both writing tributes to Blok in verse (I just finished my nth reading of Dr Zhivago and was just thinking about Blok's influence on Pasternak), and other younger poets like Anna Ahkmatova and Marina Tsvetaeva were also among those influenced by him. Blok was an important bridge between earlier Russian writers and those who rose up after the Russian Revolution.